Implementing an LMS has never been easier. But it’s still a good idea to use something to help you organize the process, especially if you are trying to hit a deadline. That’s why today’s post focuses on a tool that helps you track the progress of your implementation - and it’s free! 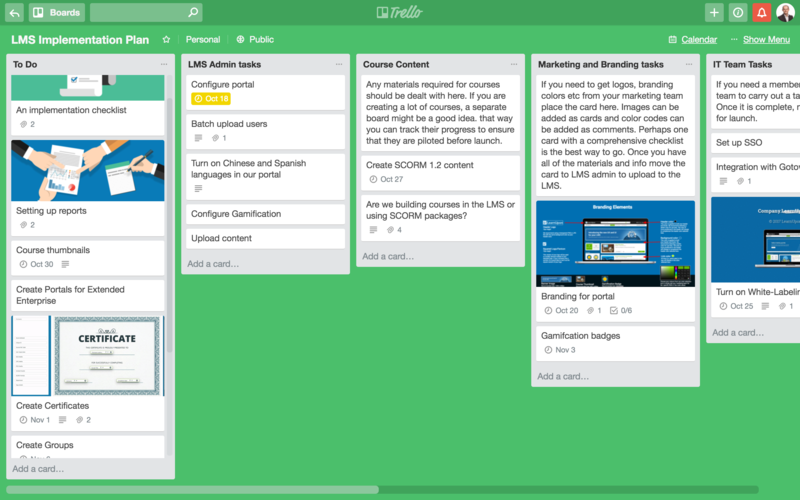 This is your guide to using Trello for an LMS implementation. Trello is a software tool that organizes projects. It can be used to map out any type of project from holiday planning to DIY tasks to software development. In this case we will be using it to effectively implement an LMS. There are lots of these types of tools available such as Asana, Jira, and Pivotal Tracker. All share the common principle of easing the task organization. A board is a workplace for a project. Each project should be given its own board where all activity is tracked. So for my DIY example, I could choose to create a board for DIY or ‘drill’ down a level and create a board for the kitchen. A collection of cards arranged in order vertically. Usually, a list denotes a commonality between the cards sitting in the list - all of these cards are similar because - they are all at the same stage: “in progress” or “completed”, or perhaps they are all being worked on by the same team. Move that card over to the marketing list! Cards contain individual tasks. On a DIY board, I can add a card for each task I want to complete such as ‘paint the kitchen’ or’ ‘put up shelves in the bathroom’. Trello is all about collaboration. Adding a member gives them access to the board. Adding them to a card ensures they receive all notifications associated with that card. I can add a family member to my DIY board so they can oversee its progress and I can add them to a particular card if they need to be directly involved. Add a checklist to a card to ensure all parts of the task are completed and nothing gets overlooked. This allows a second layer of organization. Not only is the task done, it’s done properly. When does the task need to be completed? Add a due date to make it clear which order tasks should be done. With lots of tasks to do, this makes sure each task is worked through in order so there are no bottlenecks. Each board member can comment on cards. If more information is required a member of the board can comment, even tagging in specific team members if needed. This can be achieved by including @card in your comment if you want to notify all members of your update or @”username” if you want to notify a specific team member. If you are a member of a card or someone tags you, you will receive a notification each time the card is updated. You can attach multiple files to each card. For my ‘put up shelves’ example, I could attach an image of the shelves I plan to install. I can also place in links if I need someone to review a document or another card. A power-up is a feature or integration that you can turn on on each Trello board. You get one free power up for each board and even more on paid plans. There is quite an array of powerups to choose from such as Salesforce, Slack, GitHub, Evernote, and Google Drive. If you just have one powerup to use, my suggestion would be the Calendar powerup. By placing due dates on each card a calendar is created that you can toggle into view. This gives you a visual breakdown of upcoming tasks that need to be done! But I thought LMS implementation was easy? If implementing an LMS is so easy then why would you need a tool like Trello? The truth is, you don’t. It’s not a large software development process, or a house move, or any other complex, stressful exercise. But then again neither is my DIY project! Do you have other projects running in parallel? Are you working on this project with colleagues? (This is especially important for teams who may work in different timezones). Is this the first time you have implemented software like this? Is your organization large or your use case complex? If you answer yes to any of these, use something like Trello to map everything out. Also, moving cards from ‘to do’ to ‘completed’ is very satisfying! Let’s tackle the ‘LMS implementation project’ with a Trello board. You should create a board specifically for the project. This is a great way to organize every task that needs to be completed in time for your launch date, especially if it’s looming. To make this even easier for you to imagine we’ve created a mock implementation Trello board. One key note here is that this board is for illustration purposes, it may not represent your implementation. Make sure that you populate your Trello board with everything you that your organization needs to implement! Create and name your board. We’ve gone with “LMS implementation”- simple. Make sure that you have your board set to private so that only your organization can see it (our mock example is public so that you can access it). A list is a silo that can house the cards of a team, department or project stage. You could for example place all tasks that require technical resources on a list called “IT Team”. Alternatively, a list may be “In Progress” indicating it is being worked on. Each card is a task - decide which tasks require one card to those that can be logically split. For example, branding your portal is quick and easy to do, you may, however, need help getting the right colors and images. If that is something your marketing team can help with add it to the marketing list and add one of the marketing team members to the card. to their respective lists. If you break down each set of tasks to teams or stages you have a really good overview of how each is progressing. Add members and set due dates. Add the team member responsible for the particular task and a due date for when the task should be done by. It may be that you are the person responsible for getting it done - in that case, you are simply organizing your own tasks to ensure you get everything in place in time. Trello gives you a high-level view of an implementation process, and yet contains enough detail to make sure everything is done and allows you to delegate to others involved in the process. Try it now to help run a smooth implementation process.